The Hockey Blog Adventure: Does P.K. 's move to Sweden harm his chances at Olympic glory? Does P.K. 's move to Sweden harm his chances at Olympic glory? Editor's note: This was translated from an article by frequent commenter "sleza," who lives in Europe and follows the Swedish Elite League. This is translated from an interview with P.K. Axelsson by Henrik Lundgren on the swedish hockey site hockeybladet.se. (Click the link to get the original Swedish.) P.K. 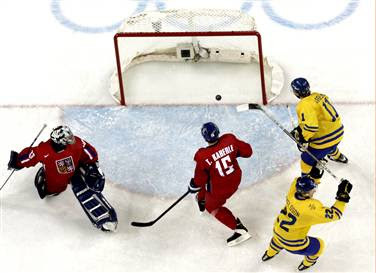 won a gold medal with the Swedish National team in 2006. After 11 season in NHL and Boston Bruins it's homecoming time for Per-Johan Axelsson - a year too early. When contract with Boston ended, he hoped to get an offer from other NHL team to avoid to risk his place in Swedish Olympic team. - There was few teams to choose but none of them were so "hot". So it was better to move home to Frölunda. How does it affect to your Olympic chances? -I have no idea. Bengt-Åke Gustafsson (Sweden's head coach) has just so many player where to choose and I don't play in the small rink any more. On the other hand, he has more oppurtunities to see me play live. But the Olympics are now season's maingoal for me. - I simply have to play great in Elitserien (SEL). That's my only chance. Bengt-Åke Gustafsson gives him hope. - It doesn't matter for me that he and Lundqvist play in Elitserien again, besides it spices Swedish hockey in very positive way. Thanks again to sleza for translating this, and if they're not too busy hopefully they'll be sending us more stuff to keep track of "Pebben." We're hoping to follow him and his team (Frölunda HC - GO INDIANS!) through this year. Because we're just not ready to let go.